This course is designed to assist the students in putting together a portfolio of work for application to DSA or local art schools, art institutions or similar course of study around the world. 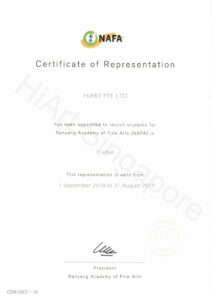 This 24-week course is designed to assist the students in putting together a portfolio of work for application to Art Schools(NAFA, SOTA, Lasalle) or similar course of study around the world. Classes are delivered once a week(subject to changes). This course aims at assisting students in the preparation of the body of work for application to their chosen area of Fine Art/Design study. This course provides students to learn and practice art in a studio like an environment full of creativity and inspiration. Broad-based and flexible in content, the course is structured to assist students not only in preparing a portfolio but training them to understand a College level studio practice in Fine Art and Design. This preparatory course will allow Students to be encouraged to develop their ideas through research and working on personal projects. Subjects covered include, drawing from observation, ideas development, college, colour work and developing a personal project. Museum visits and consultation period aim to broaden students awareness of both Historical and contemporary art practices, as well as advice on selection and presentation of work for inclusion in a portfolio for application. Beginning with the foundation of painting, we focus on creativity and skills, so that students can meet the admission standards of professional art colleges. Admission Test Traning Course only for Singapore Student Pass or Dependent Pass holder.